Rome A History in Seven Sackings – Zero Equals Two! 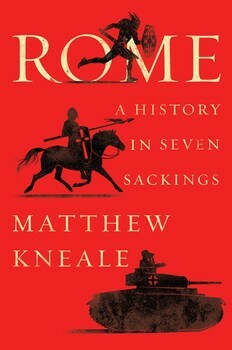 “Novelist and historian Matthew Kneale, a longtime resident of Rome, tells the story of the Eternal City—from the early Roman Republic through the Renaissance and the Reformation to Mussolini and the German occupation in World War Two—through pivotal moments that defined its history. “Rome, the Eternal City. It is a hugely popular tourist destination with a rich history, famed for such sites as the Colosseum, the Forum, the Pantheon, St. Peter’s, and the Vatican. In no other city is history as present as it is in Rome. Today visitors can stand on bridges that Julius Caesar and Cicero crossed; walk around temples in the footsteps of emperors; visit churches from the earliest days of Christianity. “This is all the more remarkable considering what the city has endured over the centuries. It has been ravaged by fires, floods, earthquakes, and—most of all—by roving armies. These have invaded repeatedly, from ancient times to as recently as 1943. Many times Romans have shrugged off catastrophe and remade their city anew.